The Wave features the TouchWhiz 3.0 UI which takes time getting used to if you are not familiar with Samsung’s TouchWiz interface. However the 3.0 incorporates a few much need functional tweaks. The 1Ghz processor ensures there is absolutely no lag in the interface. At the top of the screen is a la Android pull down mini-menu that houses neat buttons for toggling WiFi, Bluetooth and Silent mode on your phone. 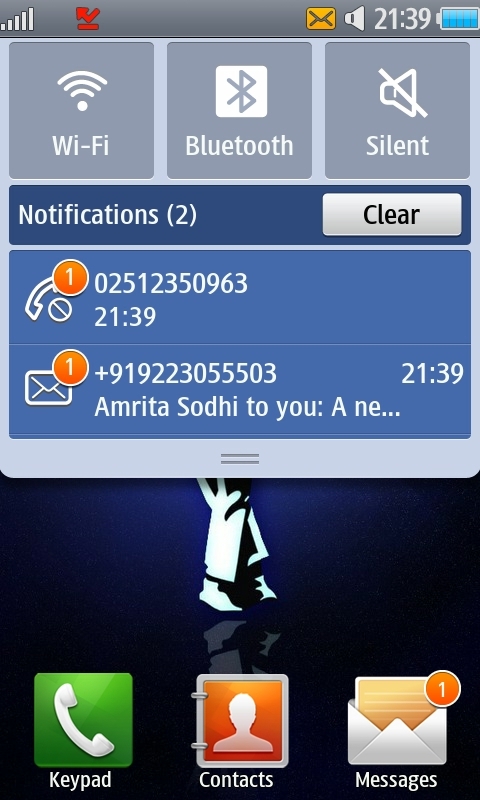 It also shows notifications from your call list, messages, emails and file transfers. 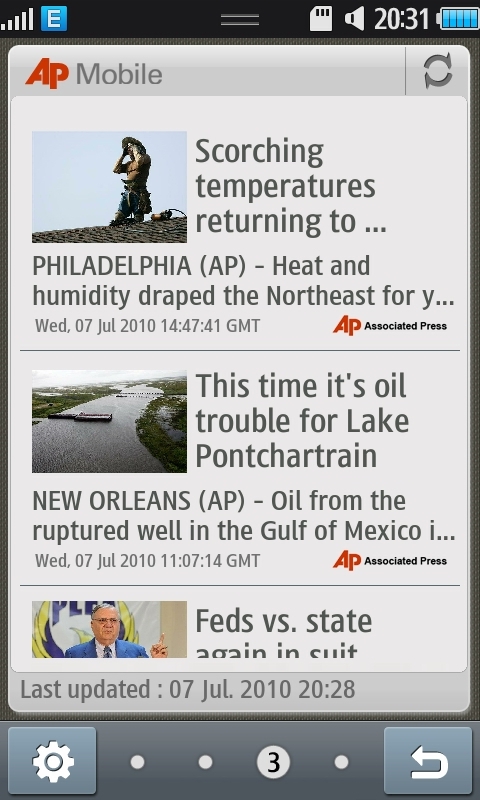 As with previous phones you can add widgets to your home screens. 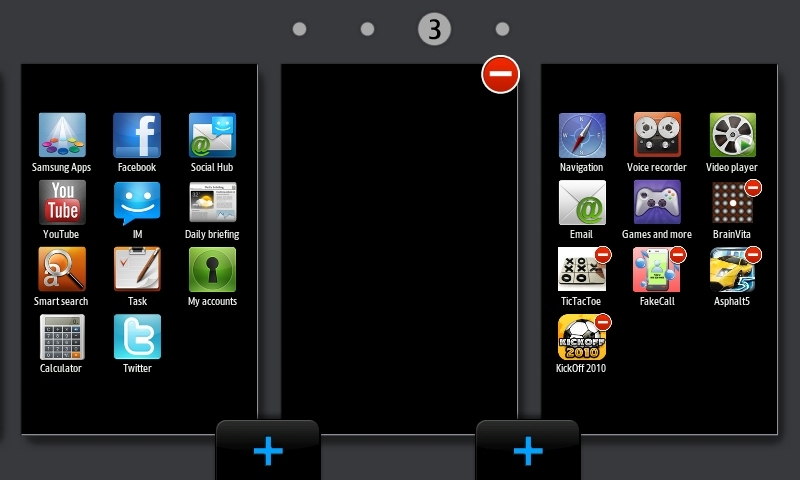 Unlike previous phones which had an irritating floating column to the left out of which widgets had to be dragged out, TouchWhiz 3.0 tucks away those widgets neatly into a panel at the bottom of the screen which can be seen by taping on the small button on the top left of the screen. A refreshing change is the number of home screens that you can have. 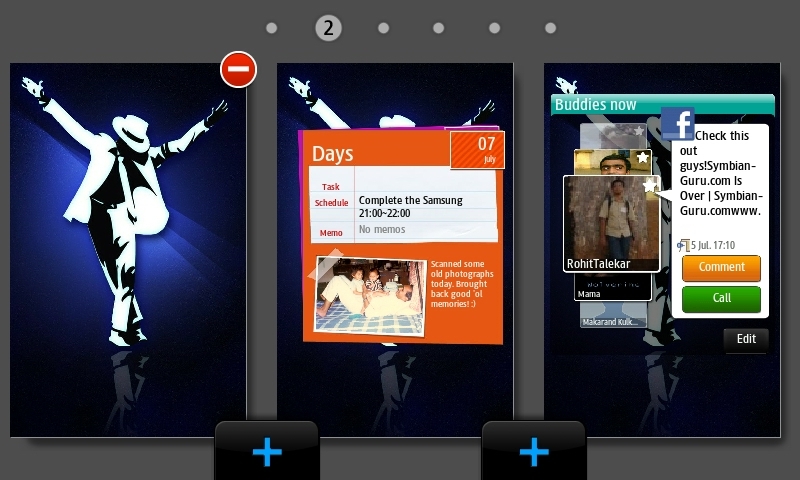 You can add upto 10 different home screens and lace them with different widgets! Yeah you read it right. 10 home screens!! Jump into the menu screen and you see an iOS style home screen. Similar to the homescreen, you can add or delete menu pages when you turn the phone landscape while you’re in edit menu mode. Scrolling the menu screens is looped, so when you reach the last one you don’t have to sweep all the way back. You can very easily rearrange icons on the home screens. With 10 menu pages at your disposal, you could group relevant icons and give them their separate pages! One functional difference is the phonebook, which now allows you to link your contacts to their IM (you can choose from AIM, Windows Live, Yahoo, Skype, QQ and Google Talk) and social accounts (Facebook, MySpace, Twitter). You can track each contact’s latest online activity through the phonebook application, which is called SNS functionality. The phonebook has rich functionality and practically limitless capacity. Open up a contact and you will see 4 tabs on top. 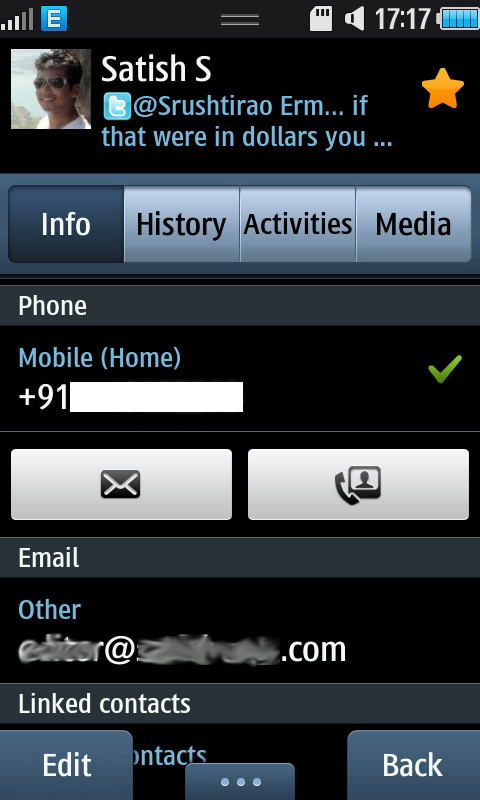 Info displays the contact’s personal details. History shows all your recent messages, calls and emails with that contact. 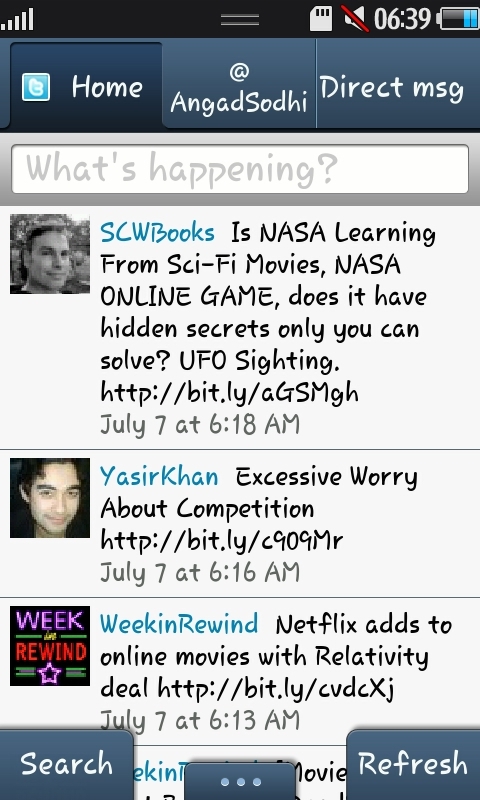 The activities tab pulls up that contact’s recent updates on Twitter, Facebook, Myspace etc. 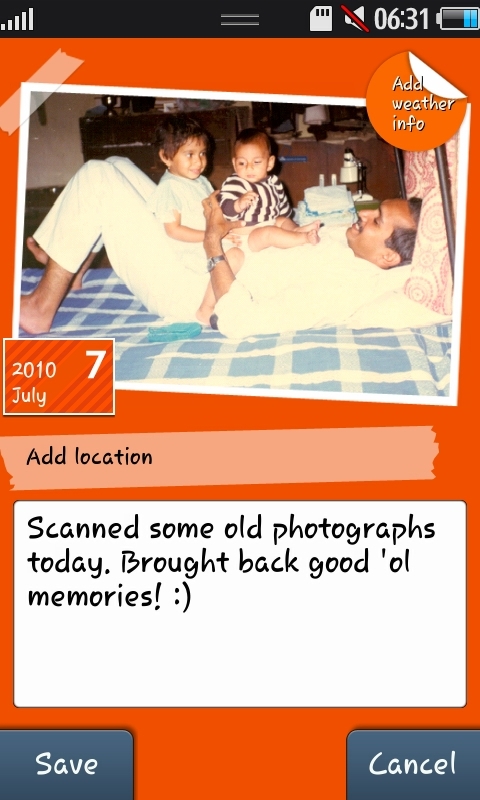 The Media tab shows photo albums from your contact’s Facebook page. I had no real problems with calls on the Wave. The phone encourages smart dialing wherein as you start to dial a number it searches the number in your contacts and pulls up that contact for you. Not a very handy feature though. Does Samsung think we remember all our contact numbers?? 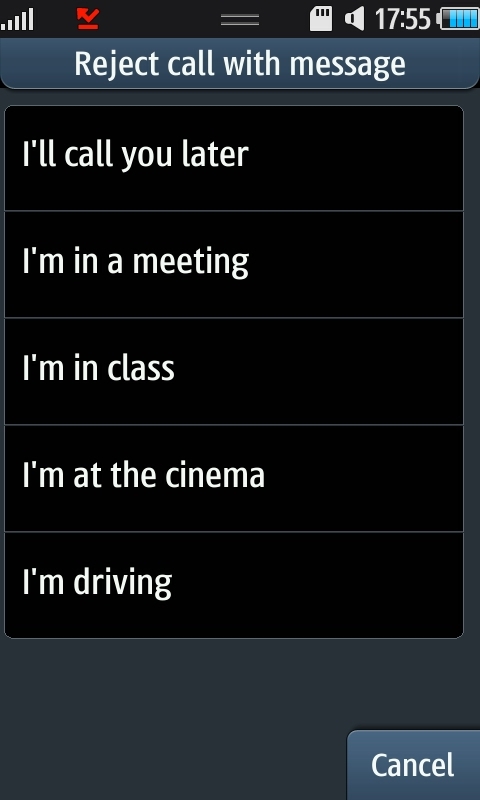 The in-call gestures deserve a special mention. When your phone is ringing, simply place it face-down on the table to silence the ring. 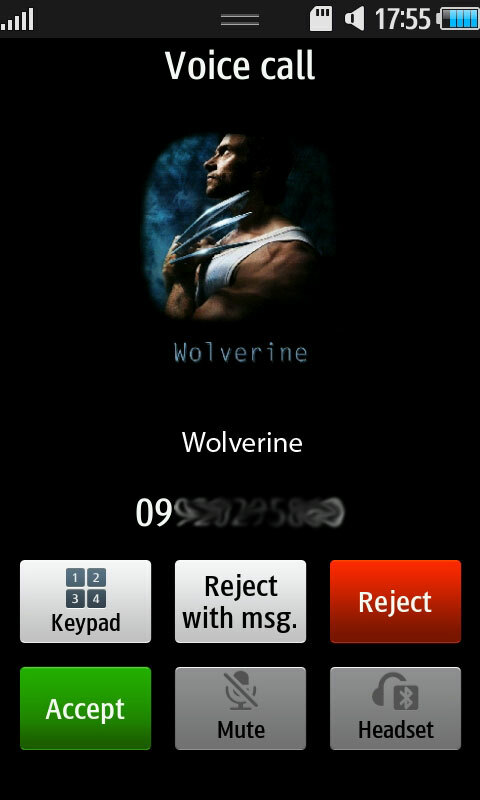 The call isn’t rejected but the ringing stops. If you can’t receive a phone call, you could reject it with a ‘I’m busy’ text to the caller. With a simple tap of the screen you could send an appropriate SMS to the caller! The Samsung Wave deserves a resounding 5 on 5 here! The message inbox offers two views – Tabbed and Conversation. 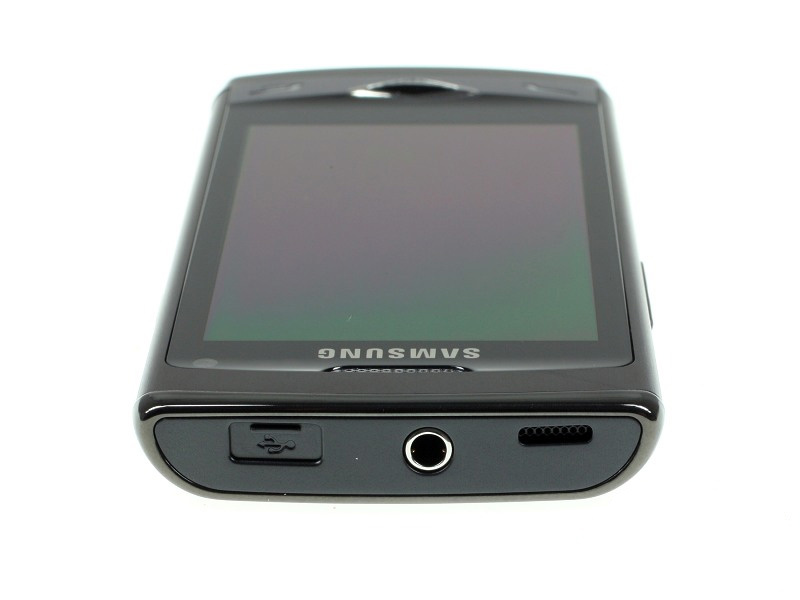 The Samsung S8500 Wave supports sending and receiving SMS, MMS, and email messages. SMS and MMS share the same editor. Setting up email on your Wave is hassle-free. Both POP3 and IMAP4 protocols are supported. For popular email clients like Gmail, all you have to do is enter your username and password and the phone does the rest! Handwriting recognition works decently on the Samsung Wave. Given that it’s a capacitive screen, you need not necessarily type one character at a time (see screenshot below). However if you do not like the idea of drawing your messages, it also gives you a few onscreen options. You can use the QWERTY keyboard in both landscape and portrait modes. Given the size of the screen, QWERTY in the portrait mode is almost impossible to use. 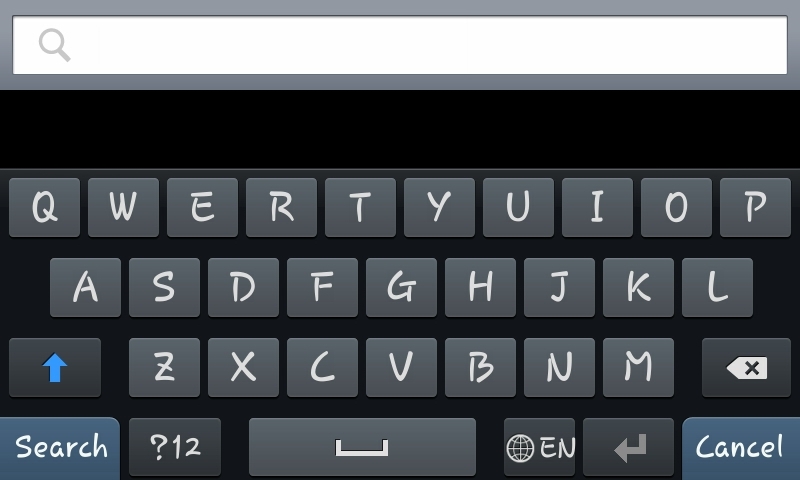 But you can use the alpha-numeric keypad style keyboard in the portrait mode. For lack of a physical keyboard, I give this phone a 2.5 on 5. Nothing magical about this phone’s on-screen keypad. Multimedia has always been Samsung’s forte. The S8500 tops it all. The Samsung S8500 Wave supports DivX/XviD files out of the box. It played DivX, XviD, MP4 and even MKV files (all in 720p resolution) with ease. It has a minimalist yet highly functional video player with all necessary settings at the tap of a finger stored away neatly into the bottom. If using the tiny bar at the bottom to skip to your favourite scene is painful you can search for a specific scene using the “Mosaic search” feature. It breaks the clip down to 16 or 36 parts and displays the first frame of each to help you find the scene you’re looking for!! The Music Browser has seen a few improvements too. 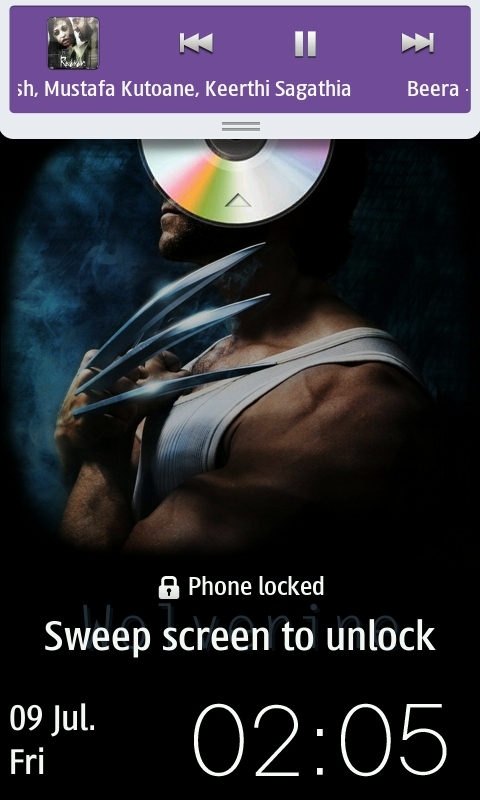 While in the landscape mode, it shows your tracks/albums as an array of CDs arranged in a circular fashion using the track’s Album Art. The list is scrollable with good inertia-like effect. Tapping on an album reveals all songs from that album. The Samsung S8500 Wave is also equipped with an FM radio with RDS. 720p videos are a joy to watch on this phone. Given a 1GHz processor, the Mosaic Search works in a snap. The clutter-free video browser combined with a nifty music player earn the Wave GT-S8500 a 4.5 on 5. 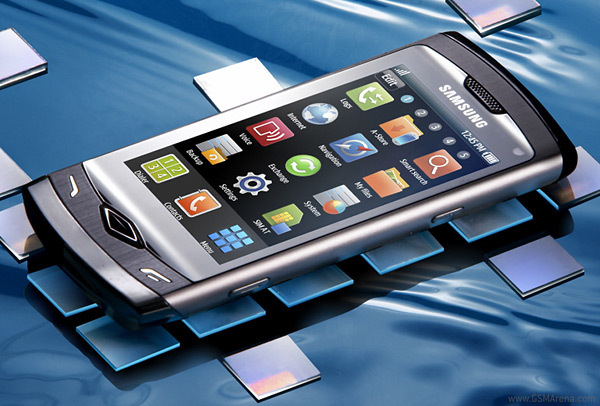 Samsung has bundled quite a few applications with the Wave S8500. Most notable is the System Manager which has 4 tabs on it. The System Manager is a nifty tool to check your device information (model number, firmware version, MAC addresses), battery info, CPU usage and memory usage. 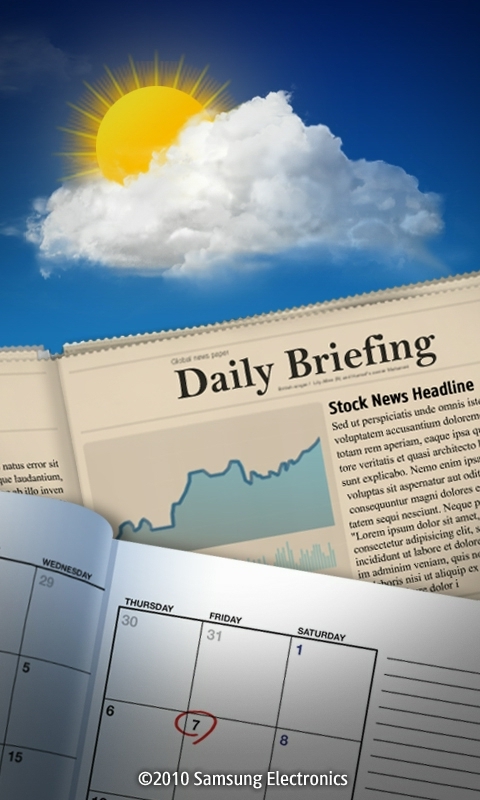 Daily Briefing is an app dedicated for weather, stock, news and your day’s schedule. It is a wonderful application to wake up to every morning, check out your stocks on it, get news updates and glance over that day’s schedule! Memo, Mini Dairy, Twitter, Facebook, Voice recorder and Palringo IM are some of the colourful and pleasant apps the Wave comes bundled with. The preloaded apps on this device are decent enough. But creating apps for this OS is upto the developer community. I’ll just reserve the score for a later date when there are more Bada apps in the Samsung Apps store. The game comes preloaded with Asphalt 5. This latest title of the popular series used the phone’s Accelerometer to control the car. 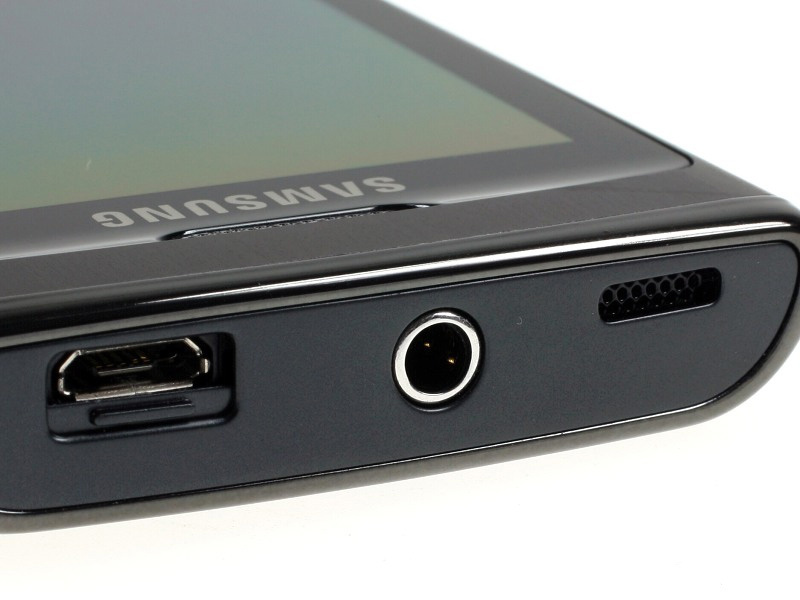 Plus, you could connect your Samsung Wave to your TV using the TV-out port (same as the 3.5mm headphone port) to enjoy gaming on a bigger screen! Check out this video of a bunch of Bloggers playing Asphalt5 on the big screen at the Samsung Blogger Meet, Mumbai. The winner got a brand new Samsung Wave!! Electronic Arts is also giving away Need For Speed Shift to the first 1 million users who download the game from Samsung Apps. You however need to download Kies to install apps on your device. However this phone also comes bundled with many games that are actually demo versions! They run 2 min trials before a ‘Buy Now’ screen pops up. Notable games among the ones that can be currently downloaded are Real Football 2010, NFS Shift, BumpCrash, MasterMinds and SlidingLeaf. 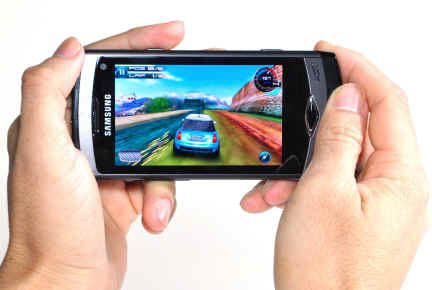 The overall gaming experience is exhilarating hence the S8500 gets a 4 on 5 here. 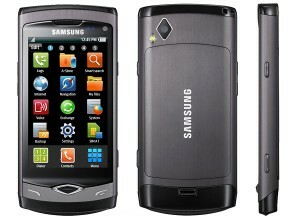 The Samsung Wave GT-S8500 comes preinstalled with the Dolphin v2.0 Mobile Browser. 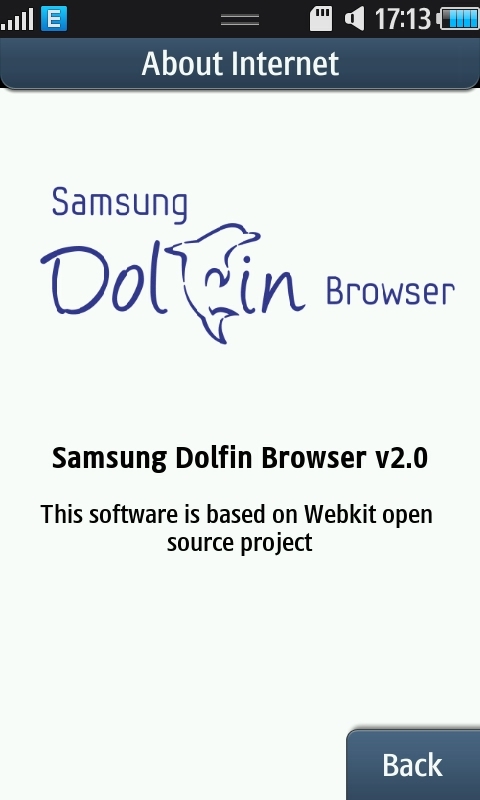 It is an open source webkit based browser which also supports flash. Support for webkit allows it to render nice smooth rounded corners. As a website designer, rounded corners ring a bell deep down in me. This browser also supports multi-touch zoom and pan. Pinch your fingers to zoom in and out of pages or simply double-tap. 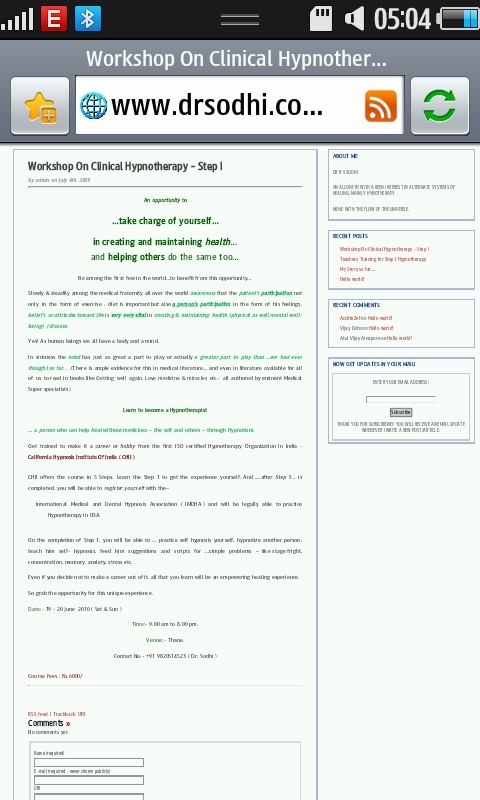 The Browser however does not reflow text when a page is zoomed. What this means is that for pages with wide columns, you have to pan around every line which is a big turn off. The BADA is the Koreans’ first strike into taking on the might of Android and the iPhone in the smartphone market. The Wave does full justice to the Bada OS. Having said that, I see the Bada OS becoming the next big thing in the mobile world. Love or hate, but Samsung is the biggest phone manufacturer in the world (in terms of number of manufacturer). Samsung insists that by the end of this year Bada would have come to many of it’s mid-range phones, a section dominated by the Corbys, Genios and the STARs. For people who still stuck with the question, ‘Why a new OS? ?’, my answer is that Samsung should have done it long ago! But now its finally here and it is definitely here to stay!! The only reason you might choose not to get this phone is if you are an Android enthusiast. In the coming few months you might just find that perfect Android phone you’ve been waiting for but definitely at a price higher than that of the Wave. A gorgeous 3.3 inch Super AMOLED which simply oozes color, Bluetooth 3.0, Wi-Fi 802.11n, Wi-Fi Tethering, 5 MegaPixels camera, 720p HD recording, 1020p HD playback, AutoFocus, LED Flash, tightly-integrated Social Networking, super customizable Home screens and Menu screens all packed into a beautiful pocket-friendly slim brushed aluminium chassis makes the Samsung Wave GT-S8500 wave a phone to look out for in the future! I’ve seen this phone at a local dealer. The screen looks very good. One of it’s USP. When buying from a dealer, the quality of the screen and how the phone feels in the hand are two things that actually entice the customer. The Wave scores in both areas! Yes this phone really looks good……….. a phone that is affordable and has some great features! What ? You can see the output on the TV ??? I think TV out is not there. Is it really possible to get the video output on tv ?? Yes Harry, TV out is present. It is turned off by default. Go to Settings >> Connectivity and turn on TV out. Then when you plug in something, it will ask you if the device is a pair of earphones or a mobile TV. Thanks for all the screencaps of the phone. That's something that was missing in a lot of reviews of this phone on the web. I've been considering buying a new phone for awhile and this is one of my considerations. 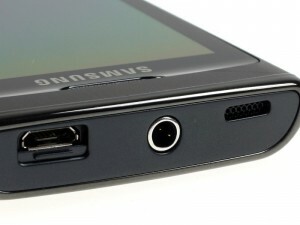 I love tech gadgets and i think its really the awesome invention from Samsung. Lots of features and elegant slim design. I gonna check it out on Google and wanna know about it more. thanks for the good article post. Hi Angad, great to see you back blogging again, I hope this new posts means we may be getting some more in the near future? Fantastic work on your review of the Samsung Wave, I will be in need a new phone very soon, and with my birthday coming up in August, the Wave will not be on my mind or sure! Great job also with your first video, looking forward to more! Samsung wave is a really great phone camera is excellent not anything bad to say about it. Battery life good, camera excellent, feauters good. This looks like a great phone, thanks for sharing this review with us. Hope to see more reviews in the future. It actually is a good point that many of Samsung’s high end phones have a lot less internal memory than the competition. A decent 16 or 32 GB microSDHC card is really expensive, and it is something that most people needs with this multimedia machine. Really impressed with your detailed review. Can you please shed some light about the Picsel File Viewer on the WAVE? — Does it come pre-installed on the Bada OS? or Do we have to buy it from the samsung apps store? I got myself a Samsung Wave and I have to say that it is the best purchase I have done for a long time. But I have a small issue. 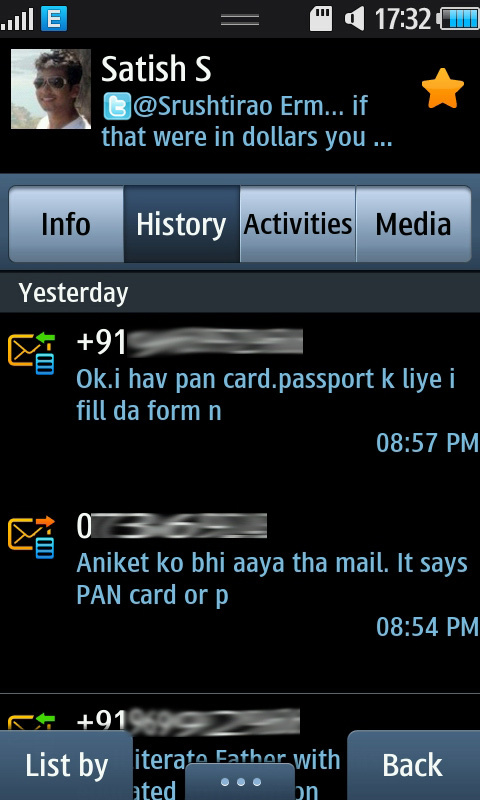 For some reason I am not able to see the Info, Activity, History and Media tab on my contact panel. Is there something to do with the settings? Would be great if someone could help me out. You should be able to see the tabs on the contact panel. There is no setting for it. Last week Samsung came out with a firmware upgrade for the Wave. Try doing that. Maybe it will help. When you are at the compose message screen, long press the button which says 'EN' (or your default language). Then click 'Keyboard Type'. And then select either 'Writing full screen' or 'Writing box'. Check out both options! Thanks for the superior article, so I've been a samsung consumer for roughly five years now, and I recently upgraded from a samsung omnia i910 to the Samsung Wave and thus far I am loving it! (I do pass over a few options of my omnia even though) I'm from Halifax Nova Scotia in Canada, I was originaly going to wait it out for the galaxy s to reach at the bell network but decided to buy the wave as a substitute and save myself $400. Can u provide the internet setting for samsung wave..
do we have feature to record phone call conversation in Wave? I bought this phone few days back. Just looking for that feature in this. These are the things which i need to fill . Hey Sandeep, you could get these settings through your gmail account's settings tab. If you can access a site through the browser using your GPRS account, you should be able to use gmail with the above settings at no extra costs! Thanks a lot again… now 1more question. Can we access Gtalk in wave…?? 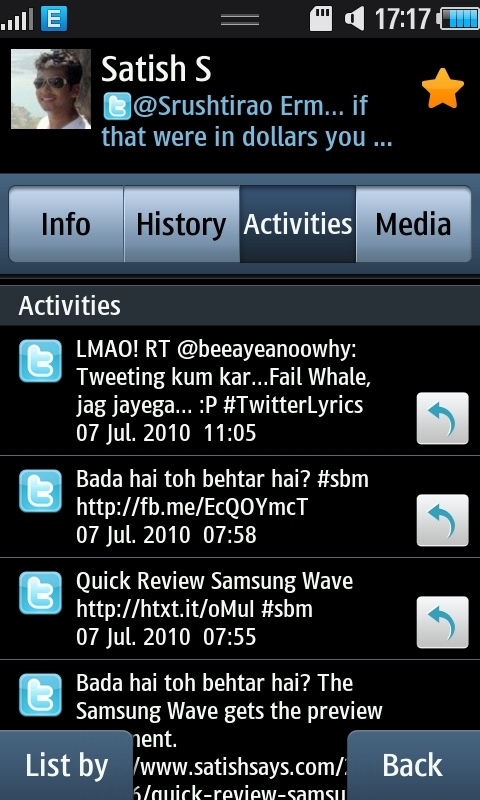 If yes then how.. and what abt the themes in samsung wave>>? ?Only 1 theme .. Please let me know how much days does the Charge last for you? Mine fully charged comes only for 2 days even without Simcard, No Wifi and no SD card. Also, the phones gets heated up while charging. Is that normal? How to add yahoo account in Palringo. I see only gtalk and AIM. I get about 2 days on a single charge with moderate use (no games being played) and Wifi on for about 4-5 hrs a day. The battery doesn't heat up significantly during charging. Maybe you should take your handset to a Samsung service center. Battery life is also my main concern with my Wave. It only lasts a day. The sad thing is I still need to make more calls whenever the charge runs out. 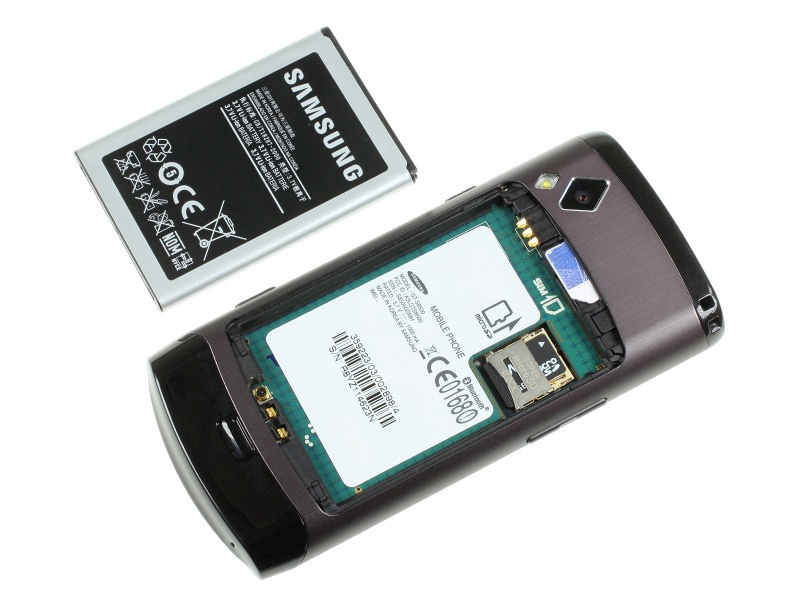 Im thinking, is it a good idea to buy an extra battery to maximize my phone for calls? can u tel me how many sms can d samsung wave inbox store? i heard it cannot store more den 200-500. I guess the limit is 1200 but the partition is not rigid as in other Samsung phones. So you could have 1200 texts in the inbox and none in all others. However, if you send a text to 10 people it is stored in the sent box as 10 different messages! Really lame in my opinion. Hey Angad thanx fr d reply.. i ve got my samsung wave a week back.. Im facing a few problems can u help me out? I am being unable to connect to the Internet using Airtel Live settings.Also i cannot log into facebook using the facebook app although i can synchronise the contacts using facebook. Is it dat the handset does not support Airtel Live or any prob with the phone? however i feel the same when playing any games and also when the mobile is kept in the pocket…. Yes Santosh, the phone does get heated up a bit when you play games on it. Your guess is as good as mine! Must be something to do with the 1Ghz proc. But then, a proc that churns out stunning graphics is bound to generate a lil heat. It should not heat up in your pocket though! Something is definitely amiss! Make sure your WiFi and Bluetooth is turned off when you are not using it. When playing games, use the earphones instead of the phone speaker. Your phone will heat up a little less! Do let us all know if you notice any change..
2. can we install third party softwares like gtalk, google maps, etc. 1. Videos from YouTube play very smoothly. YouTube recently launched a new mobile site which works a lil differently on phones that support streaming of videos. When you open up a video on youtube, it opens the phone's media browser itself. You get a short delay during the initial buffer and then the videos are absolutely smooth (depending on your WiFi /3G connections). 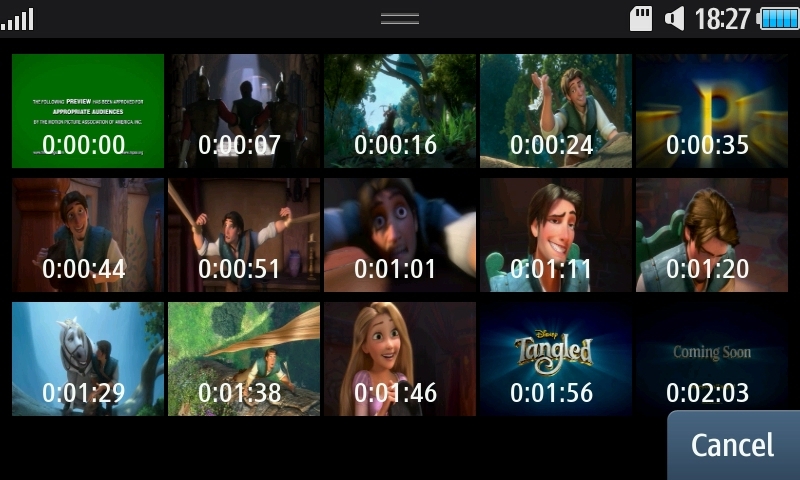 However the buffer is not very big and hence you can't jump back more than a few seconds on videos. While youtube videos show up just fine, the same cannot be said about other sites. It depends on which version of Flash their video player is based on. For eg, Vimeo works fine but Fb videos don't. 2. You'll be surprised to read this. Google probably detects the Wave8500 as an iPhone! The Wave shows all Google pages that were made for the iphone. Try Google maps thru the phone's browser. It can do everything that a standalone Google Maps app would do! Officially there is no Google Maps app for the Wave but you would definitely not miss it. 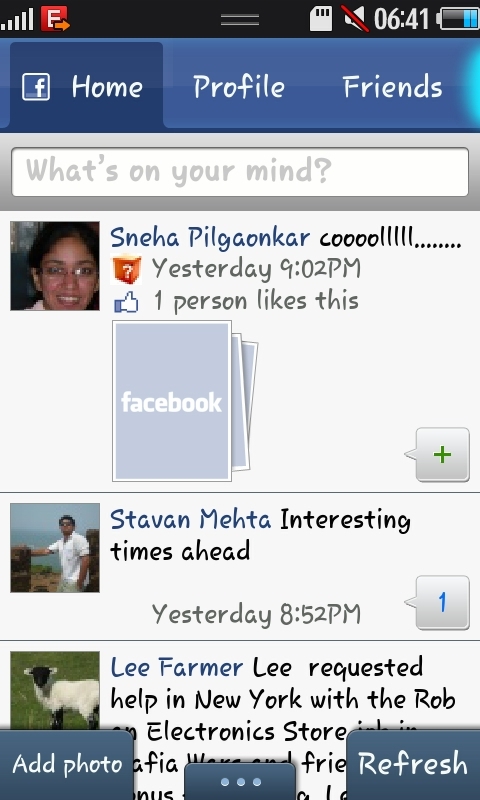 Theres no app for Gtalk but nimbuzz works just fine. 3. PDF files can be opened using the Picsel File Viewer that comes bundled with the phone. However, there is a limit on how big a file can be opened. Don't know the exact size limit but very big PDFs do not open! Even I had heard of problems with Kies. Kies works fine on WinXP. It does have a few niggles with Win7. Downloading apps is a pain with the Firewall turned on. Turn off your Firewall and the software works just fine. hey thanks a lot angad for these indepth feedback. I would like 2 ask some more things (I hope u don't mind. its my nature) 🙂 and one of them is again related to kies. Does it work on Vista???? and also it is easy to transfer dvd-rip movies downloaded from internet (size around 700-1000 mb) and blue-ray rip movies (approx 2.5 gb) onto to wave. And if transferred, does it play those movies smoothly b'coz my main purpose will b to watch movies. Obviously i'm not expecting such HD movies to play as smooth as it does in laptop or pc. 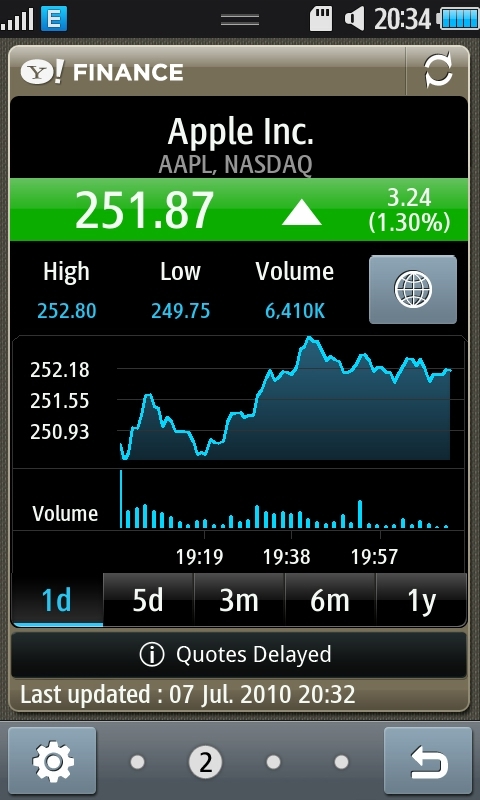 one more thing… the wave supports dolphin browser, isn't it? so can we install some other browser. and also is it possible to download files through the internet like songs, etc. using dolphin or any other browser. 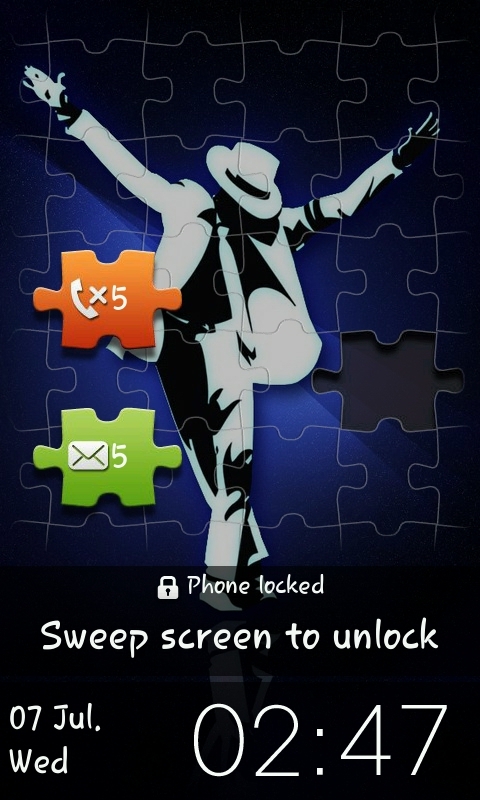 Another point… can we download wallpapers and themes from samsung apps or any other site. I've seen in HTC Legend many good themes you can play with everyday. Another doubt i have is related to firmware thing… now i am not a techno freak having good knowledge about softwares n updates etc. How should we update firmware, like do we need to connect the device to pc or if we have a internet connection on the phone, can we update on the phone itself???? and have u seen any bugs or problem been sorted out after doing an update??? and finally one last thing :). can we directly copy paste files from pc to wave without using kies??? Thanx veer, as ur name sounds… i guess u'll understand d word "veer". I wanna buy the samsung wave. I like all the features & have seen almost all reviews there are on the best mobile websites such as GSM Arena…but the customer reviews states that the battery life is really horrible. Is it true ? 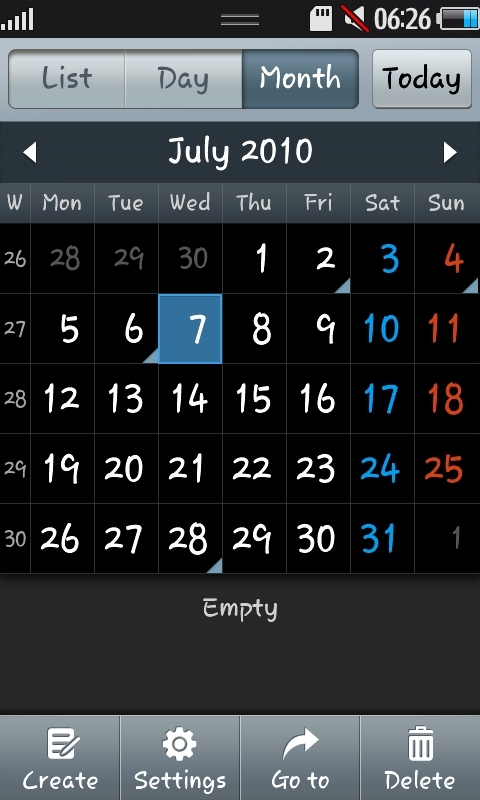 Sometimes it drains out after one day & sometimes after half a day even if there's no activity on the phone. Not 1, many wavers are complaining about the battery life. Now I am having a hick-up in buying Samsung Wave. What about your battery life ? Can we chat on gtalk & facebook on the wave ? Hi Rajarshri, Samsung probably makes the best batteries in the market today. Phones today have come a long way and battery life can no longer be measured in 'talktime'. Even with heavy usage, the battery lasts a full day. It lasts me about one and a half days but the half day is pointless according to me. Can you tell me the colors in which samsung wave comes and which one is better to choose and is there is memory card which comes with it in the box? Hey Vineet. The Wave comes only in one color. It is an black aluminium seamless design that looks and feels great. Check it out in a store. Love at first sight, I promise! 1) Open Kies- dont connect the phone to the PC yet. 2) Click the 'Kies' button on the top left button corner of the screen. 4) Click on it and let the computer recover drivers. 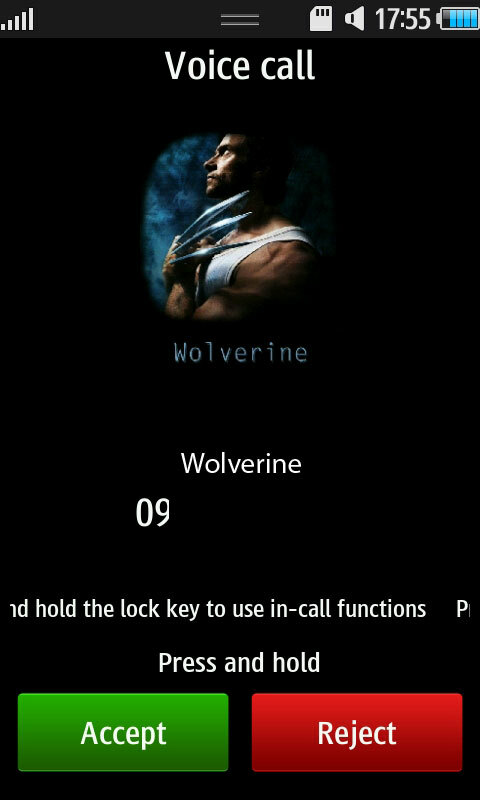 5) Hold the menu (middle) button on the phone for a few seconds. 6) Kill all the applications on the phone. 7) Connect it with PC using the USB cable. Kies should be able to detect your phone now. after watching this videos i think this phone is useful for young generation. The Samsung Wave has some unique features which can be useful for all. like the Divx support and high resolution camera. the phone has also big screen which is easy to use. The sad thing is I still need to make more calls whenever the charge runs out. Im thinking, is it a good idea to buy an extra battery to maximize my phone for calls? Is this phone has text copy/paste feature like symbian devices? hey angad i have a probz in dis phone man…..when i send multiple messages and for doing dat i forward a message and select all my friends for sending message…..at dis moment while all my friends are selected if i suddenly receive a message my phone gets switched off suddenly and gets restarted……..do u hav any solution to dis??? ?please help me out buddy…..!!!! 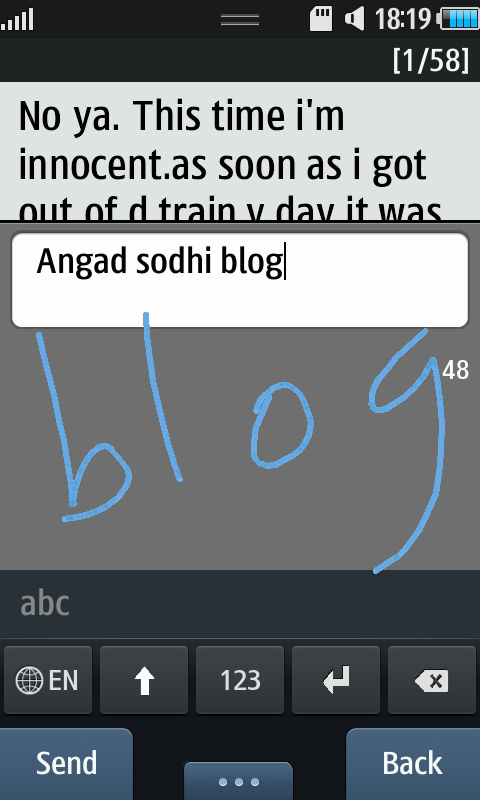 Hi, Angad, I have samsung galaxy wave II bada os, my problem is that my phone cannot open pdf file. plz help me. Thanks for the good review of Samsung Wave S8500. I really like the interface and the color of this phone, but I think I'll choose to purchase the Samsung Galaxy series instead of this one.